"The chief cook would have been termed in modern parlance, a celebrated artiste. He was named Hercules, and familiarly termed Uncle Harkless. Trained in the mysteries of his part from early youth, and in the palmy days of Virginia, when her thousand chimneys smoked to indicate the generous hospitality that reigned throughout the whole length and breadth of her wide domain, Uncle Harkless was, at the period of the first presidency [Philadelphia 1789-1797], as highly accomplished a proficient in the culinary art as could be found in the United States. He was a dark brown man, little, if any, above the usual size, yet possessed of such great muscular power as to entitle him to be compared with his namesake of fabulous history. 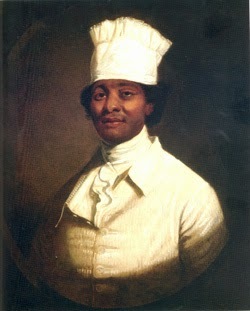 The chief cook gloried in the cleanliness and nicety of his kitchen. Under his iron discipline, wo [woe] to his underlings if speck or spot could be discovered on the tables or dressers, or if the utensils did not shine like polished silver. With the luckless wights who had offended in these particulars there was no arrest of punishment, for judgment and execution went hand in hand. The steward, and indeed the whole household, treated the chief cook with much respect, as well for his valuable services as for his general good character and pleasing manners. It was while preparing the Thursday or Congress dinner that Uncle Harkless shone in all his splendor. During his labors upon this banquet he required some half dozen aprons, and napkins out of number. It was surprising the order and discipline that was observed in so bustling a scene. His underlings flew in all directions to execute his orders, while he, the great master-spirit, seemed to possess the power of ubiquity, and to be everywhere at the same moment. When the steward in snow-white apron, silk shorts and stockings, and hair in full powder, placed the first dish on the table, the clock being on the stroke of four, "the labors of Hercules" ceased. While the masters of the republic were engaged in discussing the savory viands of the Congress dinner, the chief cook retired to make his toilet for an evening promenade. His perquisites from the slops of the kitchen were from one to two hundred dollars a year. Though homely in person, he lavished the most of these large avails upon dress. In making his toilet his linen was of unexceptionable whiteness and quality, then black silk shorts, ditto waistcoat, ditto stockings, shoes highly polished, with large buckles covering a considerable part of the foot, blue cloth coat with velvet collar and bright metal buttons, a long watch-chain dangling from his fob, a cocked-hat, and gold-headed cane completed the grand costume of the celebrated dandy (for there were dandies in those days) of the president's kitchen. Thus arrayed, the chief cook invariably passed out at the front door, the porter making a low bow, which was promptly returned. Joining his brother-loungers of the pave, he proceeded up Market street, [Philadelphia] attracting considerable attention, that street being, in the old times, the resort where fashionables "did most congregate." Many were not a little surprised on beholding so extraordinary a personage, while others who knew him would make a formal and respectful bow, that they might receive in return the salute of one of the most polished gentlemen and the veriest dandy of nearly sixty years ago."